We hop you had a great Rocktober like we did full of lots of fun and friendly events like anhc6 or our inaugural BeerCo Bottle Share meetup - tanks to everyone who came and we hop to have a lot more in the future - stay tuned in! Malt of the Month - Crisp Best Ale Malt - Hop of the Month - Sabro - Yeast of the Month - GY021 Kolsch Bier GigaYeast - Adjunct of the Month - Calcium Sulphate (Gypsum) - Equipment of the Month - Grainfather Connect - Recipe of the Month - Resistance | Kolsch - Event SlideShare last Month - anhc 6 - How to Make a Malt Tea and what's on in No-vem-Beer? How to Unstick a Stuck Fermentation - Fast Tips for Brewers! Top quality Norfolk-grown 2-row winter malting barley is widely recognised as the best raw material for traditional ale malt. During malting, high cast moistures and a balance of germination time and temperature guarantee an even, well modified malt which is ideally suited to ale brewing. The characteristic higher colour and balanced sweet, malty flavour results in this malt being one of the most popular and distinctive malt styles. 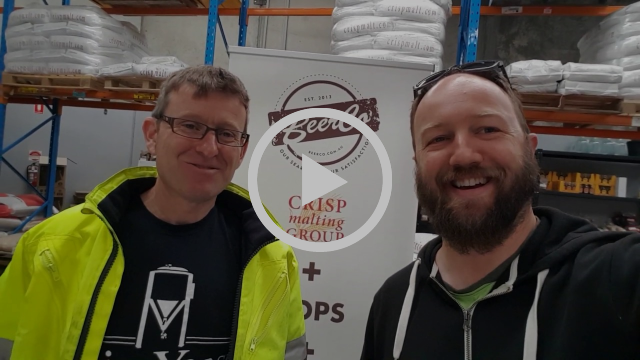 Crisp Malting Group Best Ale Malt is suited to infusion mashing and top fermentation which typifies traditional ale brewing, but is also very well suited for ale brewing using more modern techniques. Sabro™ HBC 438 US Hops - NEW! Sabro™ brand HBC 438 was developed by the Hop Breeding Company and released in 2018. Sabro’s pedigree is the result of a unique cross pollination of a female neomexicanus hop. Sabro™ brand HBC 438 is a US aroma hop that is notable for its complexity of fruity and citrus flavors. It imparts distinct tangerine, coconut, tropical fruit, and stone fruit aromas, with hints of cedar, mint, and cream. With a robust brewing performance, Sabro proves to be a strongly expressive hop that translates its flavor incredibly well into beer. GigaYeast Kölsch Bier GY021 is from one of the oldest Kölsch breweries in Köln. Fermenting under 18˚C ( 65˚F ) produces a very clean, crisp beer with a touch of ester. Perfect for Kölsch or any style where a dry, clean profile is desired. GY021 Kölsch Bier GigaYeast produces a moderate amount of sulphide that will dissipate completely. Ferments cold similar to GY019 Kölsch Bier GigaYeast to produce crisp tasting lager-like ales. Calcium Sulphate (Gypsum) is an important mineral for its effect on mash and wort pH. Used to harden water when brewing ales and bitters. Use as required depending on water hardness. Gypsum (Calcium Sulphate) adds permanent hardness (calcium ions) to brewing water; 1 gram per US gallon adds 62 ppm calcium, 147 ppm sulfate. Harden Up Brewers - Buy Some Gypsum! The Grainfather, is your all in one electric brewing system, to make beer from grain. FREE SHIPPING to all customers in Australia and you can take your pick of one of our popular BeerCo Recipe Kits and we will throw one in for FREE as well. The sleek look, user friendly, intuitive design, and innovative features, make this your perfect brewing companion for both experienced and beginner all grain brewers. It is made from high quality 304 grade stainless steel with a 30 L capacity, designed to make up to 23 L of beer from one brew. Vive La Resistance! What are we resisting? Everything except flavour and refreshment - time to brew a clean simple in balance refreshing Kölsch you and your brothers and sisters can enjoy all summer long. Light in colour but not light on malt character and with a modern Kiwi hop twist the only thing you will be resisting is the temptation to pour another glass. Prost! Vive La Resistance! Brew some Kolsch Bier! Come and say Hi! at the ADA Annual Conference 11-13 November in Adelaide. We will be there and would love to talk to you about Crisp Malt!